Weeks 8-9 of Achilles Tendon Rupture Recovery - Ian Lee - Marketer, Photographer. As the recovery weeks go on, I find myself taking less Advil. In fact, there are were days where I only took 1 pill of a 400 mg of Advil gel. The last 2 weeks were also where I started running basketball practice without the use of a wheelchair; just used my crutches and a fold-up, fabric lawn chair to sit on as the benches were a little low for easy sitting. Week 7 of my recovery was my second appointment with the orthopedic surgeon. This was the day that the first wedge was removed from my Össur Rebound Air Walker boot. After the wedge removal, I felt tenderness on both sides of ankle and a lot of stretching in the tendon area. Now at Week 9, 2 weeks after the first wedge removal, I was given the ok to remove the second wedge from the boot. As the ortho tech taught me how to remove the wedge properly, I did not need another appointment at the surgeon’s office. I just removed the wedge myself and re-applied the double-sided sticky tape to hold the third and final wedge in place. Removing wedges lowers your heel to the ground and begins to stretch and lengthen the Achilles tendon. Once again, the first 2 – 3 days after removing the wedge, I felt tenderness on the inside and outside of my ankle. There wasn’t much pain in the Achilles tendon itself so the most discomfort was felt in the ankle area. So it ‘s back to slow walking and consciously remembering to be gentle when my heel strikes the ground. Doing some things became easier. While showering, I noticed I can use my hand to bend my toes up much to a much higher degree as my toe joints are less painful from being in the boot. Maybe the change of the heel height made a difference since wedges have been removed. I also found it easier to sit up and wash my foot since the tendon is now longer after removing the heel wedges. This means it’s also easier to lift my entire leg up to wash the sole of my foot. 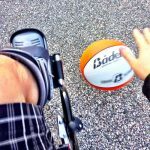 For basketball practice and games, I am still using crutches for faster movement and greater mobility. Here I am at a TCYBA coach clinic before the start of the 2016 Spring season. When I look down and see a fragile looking calf (if that is even possible), it makes me want to get active rehab started right away. My injured calf, at the widest circumference, is 1 inch less than my normal calf! That seems like a massive difference just because of a few weeks of minimal use. It’s been a slow road to recovery. Hopefully, the toughest part, the first 6 weeks of non-surgical recovery after an achilles rupture, is over. Can’t wait to get back on rehab for strengthening; just cannot wait.